The remaining US troops in Iraq are scheduled to leave by the end of this month. While there had been some talk about extending the December 31, 2011 deadline President Obama set early in his term, this was scuttled in October when the Iraqi government rebuffed the administration on two demands: that US troops be guaranteed immunity from prosecution and that the Pentagon be allowed to maintain bases in the country going forward. While the US will retain a large embassy and two consulates in the country, with 4,000 to 5,000 contractors (down from a high of 180,000), this is a different outcome from the US government’s original expectation of permanently maintaining scores of military bases, including superbases, in the country designed to indefinitely anchor the US geo-political presence in the Middle East. While we may learn later that this long-term strategy, against all political obstacles, remains on track (including a plan for all that oil), the nearly nine-year-old occupation of Iraq is apparently coming to an end. Except for the occasional newsflash about sporadic violence—and the recent spate of stories about the sheer tonnage of materiel that the US is shipping stateside as it readies its departure—we don’t hear much about Iraq these days. The action has moved on to Afghanistan, Pakistan and Yemen. But five years ago, things were very different. The military, political, and economic shockwaves from the US invasion in 2003 were roiling the country, the sectarian violence was mounting, and Iraq was awash in blood and inconsolable sorrow. The human wreckage—as well as the huge economic toll—defied comprehension (and the bloodless number-crunching that surfaced now and then). In the original run up to the US invasion, millions had mobilized, but after President Bush unleashed his “Shock and Awe” blitzkrieg, this momentum faltered. By 2006, however, US public opposition to the war was again deepening, fueled by the three years of work that the anti-war movement had put in. United for Peace and Justice—a coalition of 1,400 groups—as well as many national organizations (including Peace Action, Veterans for Peace, American Friends Service Committee, and the National Campaign for Nonviolent Resistance) had worked tirelessly to strengthen and broaden this longing to end the war. In the midst of this, a handful of us began to develop a new project: The Declaration of Peace. This initiative was prompted by an email I received on Christmas Day 2005 from Michael Nagler, the nonviolence scholar who now writes for this site. In his note, Michael proposed that, instead of continuing to organize limited or sporadic actions, the anti-war movement should set a deadline for a US withdrawal from Iraq. If this schedule were not met, the government would face widespread civil disobedience. A civil disobedience pledge would be created and circulated (here he was explicitly referencing The Pledge of Resistance, which was organized in the 1980s to protest US war in Central America), and signers would participate in nonviolent action trainings to get ready. Moreover, Michael suggested that this action strategy insist on a concrete peacekeeping alternative and peacebuilding plan. I vividly recall reading Michael’s email. Moved by its vision, I immediately sketched a strategy paper that I sent off to Michael and a couple of other colleagues. Eventually, we decided to test this idea in the larger movement. A lot of online and face-to-face conversation followed with many existing groups and individuals. We were supported in this process by our own organizations, including Pace e Bene Nonviolence Service, which gave several of us on staff the green light to see where this might go. The campaign emerged as numerous key organizers joined the national organizing committee. Without presenting a detailed history here, suffice it to say the project gained traction and helped focus the anti-war work that year. We developed a declaration that called for a comprehensive, concrete and rapid plan to end the war in Iraq—and a grassroots nonviolent action strategy if this plan was not established by September 21, 2006, the International Day of Peace. The plan included a prompt timetable for withdrawal of troops; no permanent bases in Iraq; an Iraqi-led peace process for security, reparations, reconstruction and reconciliation; restoration of Iraqi sovereignty over its economic and political affairs; increased support for US veterans of the Iraq war; and the shifting of war funding to meet education, healthcare and employment needs at home. Signing the Declaration of Peace was a way of backing this plan. But even more importantly, it was a commitment to take public action to help move it forward. In addition to organizing local campaigns and hosting nonviolent action trainings, signers inundated Congressional offices that summer urging their senators or representatives to sign the declaration. Most demurred, saying they did not sign other people’s pledges. (In more recent years such sentiments haven’t prevented conservative Congress-members from signing Grover Norquist’s pledge to oppose tax increases.) In the end, only 12 members of Congress signed the Declaration of Peace. But this lobbying seemed to have made an impact in other ways. 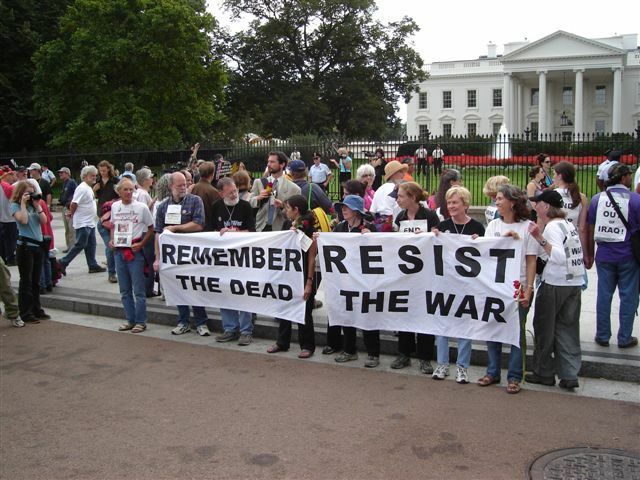 It alerted Congress to the anti-war movement’s growing momentum and may have played a role in shifting the focus of the impending fall Congressional elections from shying away from discussing Iraq at all to making the elections a plebiscite on the war. In the end, The Declaration of Peace was signed by 20,000 people. It was endorsed by 800 national and local organizations that organized 375 events across the United States, which included hundreds of people engaging in nonviolent civil disobedience, from September 21 through September 30. While it was originally conceived of as a one-time effort, it went on to organize four more campaigns. Some of us associated with The Declaration of Peace also helped create Christian Peace Witness for Iraq, which annually gathered for faith-based nonviolent action in Washington, DC for several years, including a service held in March 2007 at the National Cathedral followed by 222 members of the religious community being arrested as we engaged in nonviolent civil disobedience at the White House. The audacious timeline that The Declaration of Peace set out was not met. It is sobering that US withdrawal from Iraq did not materialize for another five long years filled with more death, destruction, and instability. More somber still is the fact that the vision we struggled for—a plan that would include a peace process that would address security, reconstruction and reconciliation and a “peace dividend” here at home—remained, unfortunately, only a vision. While there were “surges” and “drawdowns” over the last half-decade, no comprehensive plan for genuine peace, reconstruction, and reconciliation was implemented. At the same time, it is worth noting that, had the anti-war movement not mobilized as it did since 2003, it is likely that the US would have had boots on the ground in Iraq indefinitely (as Sen. John McCain and others have seemed to call for recently). Quite likely US bases would be firmly entrenched there (as they have been in other places following US wars, including Japan, Germany, and Korea). And there would likely have been the continuing provocation and instability that an occupying power incites. Social movements alert, educate, and mobilize the populace to shift its thinking to create the conditions for change. The role of the anti-war movement cannot be overlooked in accounting for this new course. Nevertheless, much remains unfinished. A key task is accounting for what the US did. Before moving our public awareness to the next battlefield, we are in need of stark truth-telling about what went down: tearing a nation asunder, prosecuting a horrendous counter-insurgency campaign, and conducting systematic torture, all under official pretexts that turned out to be scandalously false. To engage in the requirements of restorative justice (which, though often ignored by power-holders, are incumbent on us as a society) first requires an engagement with the truth. Without this, we will not only continue this pattern of waging long and costly wars, we will have missed an opportunity for transformation that is sorely needed.